Stephen is the Director of International Tennis Coaching Ltd. He was ranked no. 10 in Queensland, Australia. He has also represented Bedforshires County Team in the Summer and Winter County Cups. Stephen was part of Stirling Universities International Sports Scholarship Programme. Stephen was awarded the Meme Griffiths Award through the Bucks LTA for his outstanding contribution to tennis in Buckinghamshire in 2018. Kate is a level 5 tennis coach with over 30 years coaching experience. Kate grew up in Somerset and loved the game from the moment she picked up a racket aged 8. Kate attended Millfield School and represented Great Britain as a junior. She moved to Buckinghamshire and represented Bucks County for many years. Kate has worked at many clubs and has spent the last 20 + years as the Head Professional at Wycombe Abbey School. Kate enjoys teaching all ages and all standards and is an ongoing student of the game. Ercan started playing tennis at age of 7 in his native Turkey. He represented his country as a national player in all junior categories. He was awarded a scholarship at the University of North Alabama where he played as No.1 and No. 2 singles and doubles player. He has 14 years of experience of coching at all levels for both junior and adult categories on either an individual or group basis. rcan is a methodical and dedicated coach who likes to focus on the complex technical and tactical development of a player to enable him/her to achieve their goals and aspirations. Carys has been playing tennis for over 12 years. She plays at Chalfont St. Peter Tennis Club as well as Bull Lane Tennis Club. Carys is a 1st team player and has won many Club Championships in singles and doubles. Carys has umpired at competitions and has assisted with Summer Camps. Notably Carys worked at the Boodles Exhibition Tennis Championships at Stoke Park and was a ball girls at the O2 Arena for the ATP world tour finals. Carys is looking at attending her LTA level 1 qualification this year and assists with coaching children up to the age of 18 years of all standards. Alice started tennis at the age of 5 and has competed for both Farnham Common Tennis Club and Beaconsfield High School. She is now at University and assists with our holiday camps. Alice coaches tiny tots, mini tennis players, juniors and adult beginners. Tom has been playing tennis for most of his life; over the past 10 years he has competed in hundreds of tennis tournaments up and down the country. He previously worked at Gerrards Cross Bull Lane Tennis Club, and played for the men’s teams there from the age of 13. 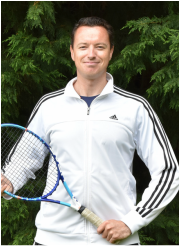 He delivers Mini Tennis, intermediate juniors and beginner adult lessons, as well as private lessons. He is currently an LTA Level 2 qualified coach and is looking to get his Level 3 in the next few years. Ffibi has been coaching for the past 2 years. Her areas of expertise are the tiny tots and the mini tennis classes. Ffibi is also one of the best female 18/U players at the club winning the 18/U Junior Club Championships in 2015 & 2016. Ffibi was also awarded the young volunteer of the year award in 2015 through LEAP. Celine has been coaching for the past 3 years. Before starting at Bath University she won a number of singles titles including the Riverside 18/U girls championships in 2012. Celine was also The 3 Rivers and Watford District Young Leader of the Year in 2013. Celine brings a wealth of passion and enthusiasm which she passes on to the pupils she coaches. Celine is available to coach all ages of players who are beginner and intermediate standard.